When painting outdoors you want to take only the necessary items. 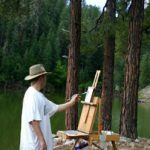 The fewer paints, brushes, paint thinner, and so forth will keep your gear lighter and help you to have a better experience painting outdoors. Remember it’s not just about art supplies you also need to take water, bug repellent, sun screen, food, trash bags, hand clamps (to clamp you paint thinner container to your easel), screw driver(to tighten up and adjust your easel), pliers(to loosen the caps on paint tubes), and trash bags. Limiting your color palette helps to keep your equipment light. I use just eight colors: Cadmium Yellow Lemon, Cadmium Yellow Deep, Cadmium Red Light, Alizarin Crimson, Ultramarine Blue, Phalo Blue, Ivory Black and Titanium White. 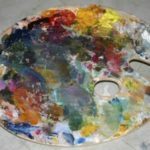 Learning to use this palette you will be able to mix a full range of colors. While Painting you use a lot of paper towels to keep you brushes clean. As landscape painters we enjoy the landscape. So we want to keep the landscape enjoyable for everyone. You always want to take out of the landscape what you take into it. So use your trash bags and make sure you are leaving no trace once you leave the landscape. It’s always a good idea to take a camera with you. 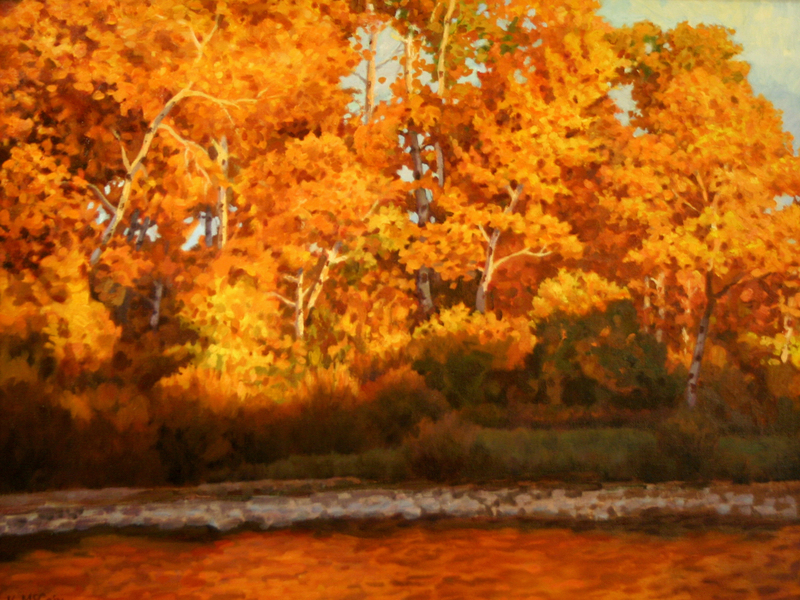 Painting on location is great for capturing the light and mood of the landscape. Photographs are great for capturing the details of the landscape. Then if you need to finish the painting in studio you have the photo to use as reference. A good pochade box is worth it’s weight in gold, these small easels are light and easy for more remote excursions and locations. If you aren’t going far or to remote locations a french easel is a wonderful alternative they are far more stable than pochade boxes and you can pack most all of your supplies inside the easel, though they aren’t as light as pochade boxes. These compact easels and painting boxes are essential to paint outdoors. Your eyes are your most important asset so you should protect them. The bright sunlight over the years can seriously affect your vision. Though some people wear hats to keep the sun out of their eyes, a hat doesn’t always solve the problem so I wear sun glasses. When I paint I don’t look through the sunglasses because the glasses change the colors and values of the landscape. So I usually hang the sun glasses off the end of my nose so I can look over the top of them. This way I keep the direct sunlight out of my eyes and I still am able to see the accurate colors and values of the landscape. 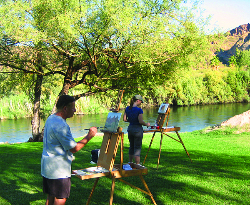 These tips will help you to have a wonderful experience when you go outside to paint. Good tips. I’m heading out tomorrow morning. Looking forward to a fun couple of hours, maybe two quick sketches in oil, before calling it quits. Sounds great. Let me know how it went.